The What: Lifesize has released its new global cloud service architecture and Icon 700 conference room solution. The complete video conferencing solution represents the flagship technology in a new line of next-generation Lifesize offerings. Designed with what Lifesize says is industry-first 4K video conferencing capabilities, the solution offers full-motion 4K content sharing. The What Else: The 4K global cloud service architecture and the Icon 700 conference room solution with full-motion 4K content sharing, and premium audio clarity delivers the absolute best video conferencing experience on the market, according to Lifesize. 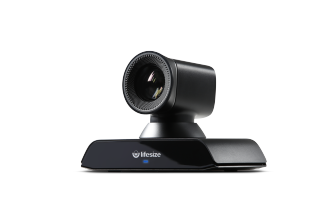 Lifesize says highlights of the new solution include: first-ever 4K video conferencing with full-motion content sharing in 4K; native integration with easy-to-use cloud service designed for live 4K video; ultra-wideband Opus audio for exceptional audio clarity optimized for human speech; and the industry’s highest quality for multiparty calls and recordings. The Bottom Line: Priced at $7,499, the Icon 700 offers a future-proof 4K solution for the price of competing 720p solutions.